Divisions over whether to provide a conduit to citizenship for young “Dreamer” immigrants brought to the U.S. illegally loomed as the pivotal sticking point Wednesday as House Republicans searched for a solution to their campaign-season standoff over an issue that has split them for years. GOP leaders, moderates and conservatives bargained anew, with some saying the talks were productive. But there was no evidence an agreement was at hand, while there were signals the party’s long-standing chasm over whether to help immigrants here illegally become citizens remained unresolved. Rep. Carlos Curbelo, R-Fla., a leader of moderates trying to force leaders to hold votes on the issue, told reporters that of all his immigration priorities, permanent status for Dreamers was “most important” and “essential.” But Rep. Mark Meadows, R-N.C., leader of the hard-right House Freedom Caucus, said that “no special pathway to citizenship” would be acceptable to conservatives. FILE - Freedom Caucus Chairman Rep. Mark Meadows, R-S.C., speaks to reporters on Capitol Hill in Washington. Divisions over whether to provide a conduit to citizenship for young “Dreamer” immigrants brought to the U.S. illegally loom as the pivotal sticking point. 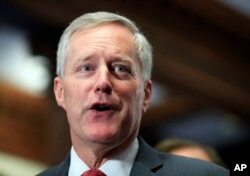 “Why would we give blanket waivers to people who came here illegally?” Meadows said to reporters. Curbelo and Meadows both said it was possible to find middle ground between their positions. But compromise has eluded party leaders for years, and it remained unclear how they would resolve the impasse by next month, when House leaders have promised showdown immigration votes. Leaders set a pivotal closed-door meeting on immigration among House Republicans for June 7, days after lawmakers return from a weeklong recess. Rep. John Katko, R-N.Y., said he and other moderates would see if that session could produce an accord among Republicans before pressing ahead on a petition drive that could force votes on the issue. “If they come to a good agreement, great. If they don’t we’re going forward,” he said. Bills backed by moderates would give hundreds of thousands of Dreamers a way to become permanent U.S. residents, a status that can later lead to citizenship. Dreamers were brought to the U.S. illegally as children and have been temporarily protected by an Obama-era program that President Donald Trump has terminated, though courts have kept alive for now. Conservatives want legislation that would let those immigrants stay in the U.S. in renewable but temporary increments. They have opposed creating a new way for them to move toward citizenship and would instead limit them to existing pathways, such as marrying a U.S. citizen. 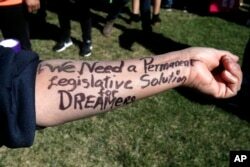 Ivon Meneses of Las Vegas wrote "We need a permanent legislative solution for Dreamers" on her arm as she and other supporters of the Deferred Action for Childhood Arrivals program attended an action in support of DACA recipients, March 5, 2018, on Capitol Hill. Curbelo and other moderates gained their 21st Republican signature Wednesday on a petition that would force a series of votes on immigration bills that House leaders are trying to avoid. With all 193 Democrats expected to sign, the moderates need just four more Republican names to reach 218, a House majority, and moderate leaders say they have enough commitments to reach 25. The moderates want votes on four bills, including measures by conservatives and liberals. Under that process, the measure likeliest to prevail would let Dreamers stay in the U.S. permanently and bolster border security, but not finance the border wall with Mexico that Trump wants. Since that bill would be backed by virtually all Democrats but just a smattering of Republicans, House Speaker Paul Ryan, R-Wis., has tried to derail the drive. Instead, GOP leaders plan for the House to vote on immigration the third week in June, a week before the votes moderates want could be held. Republicans say the only measure leaders have committed to consider is a conservative package that would reduce legal immigration, help Trump build his wall and punish “sanctuary cities” that hinder federal authorities pursuing immigrants here illegally. Under House rules, if the chamber votes on that measure first, it would force the moderates to begin their petition drive all over again, Republicans say. That would be a blow to moderates because many face difficult re-election races in pro-immigration districts and want to show voters progress before November’s elections.